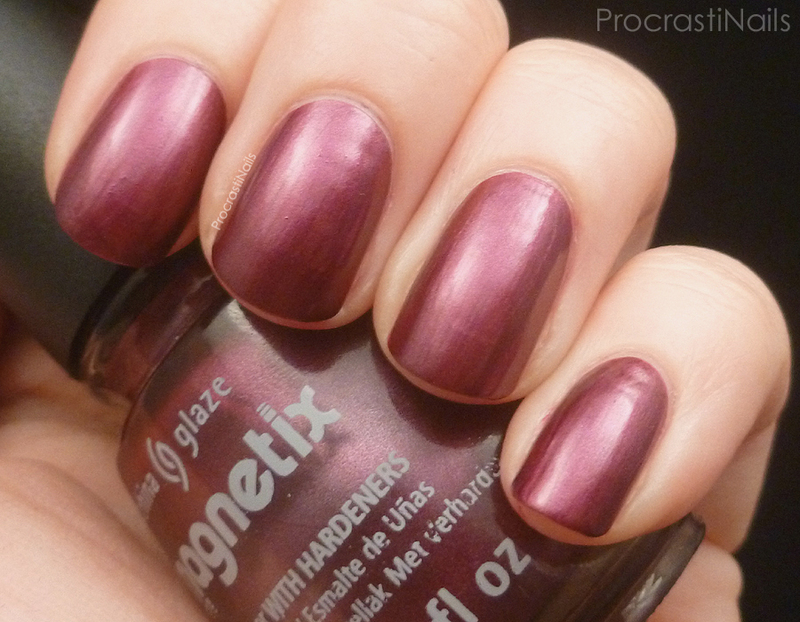 China Glaze Magnetix 2012 Swatches! Attraction and Positively in Love! Alright, let's get a start on this pile of swatches I have to do! 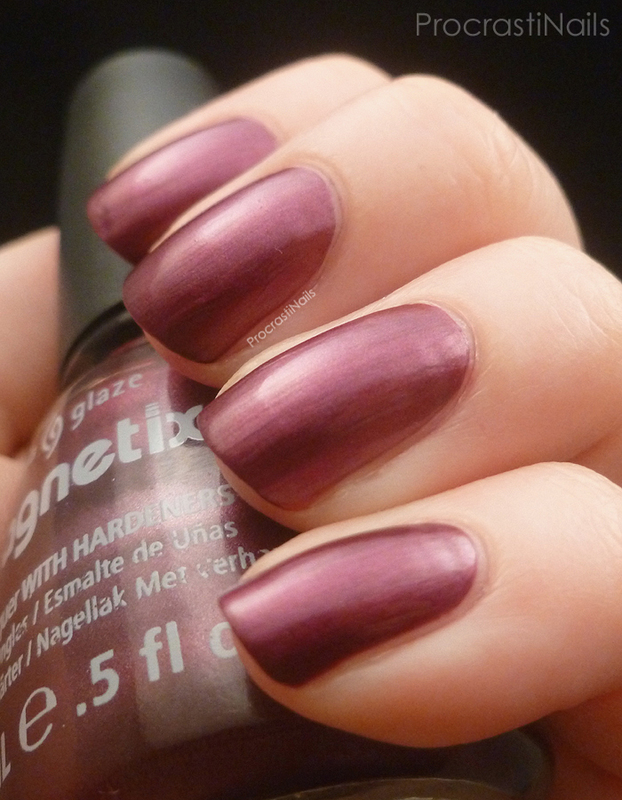 China Glaze Attraction was at the top of the list, so I decided to swatch it along with the other Magnetix polish that I own - China Glaze Positively in Love. My only issue? I. Hate. Magnetic. Polishes. Arrrgghhhhghgh. 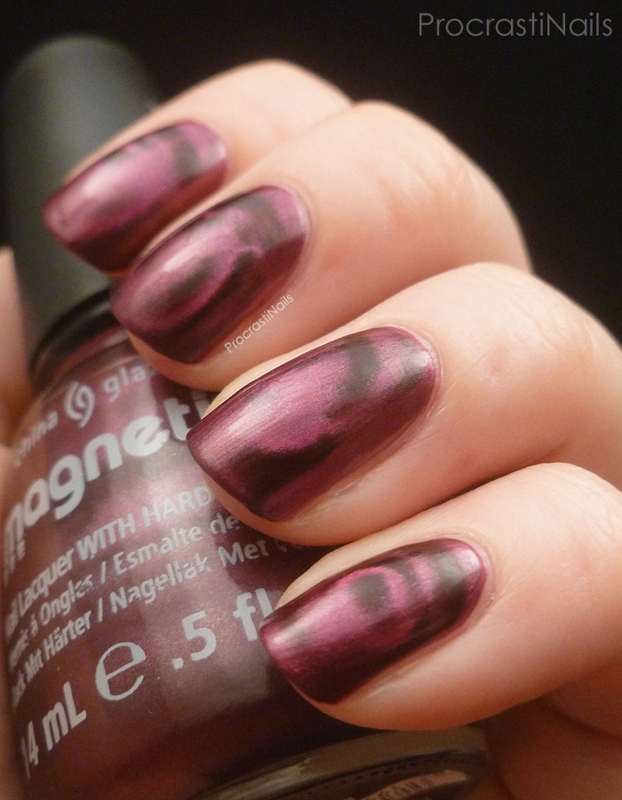 My nails are very curvy so I've never been able to get a full or clean magnetic image when I use the magnets. But for you guys I gave it another try (grumble grumble). So let's take a look. 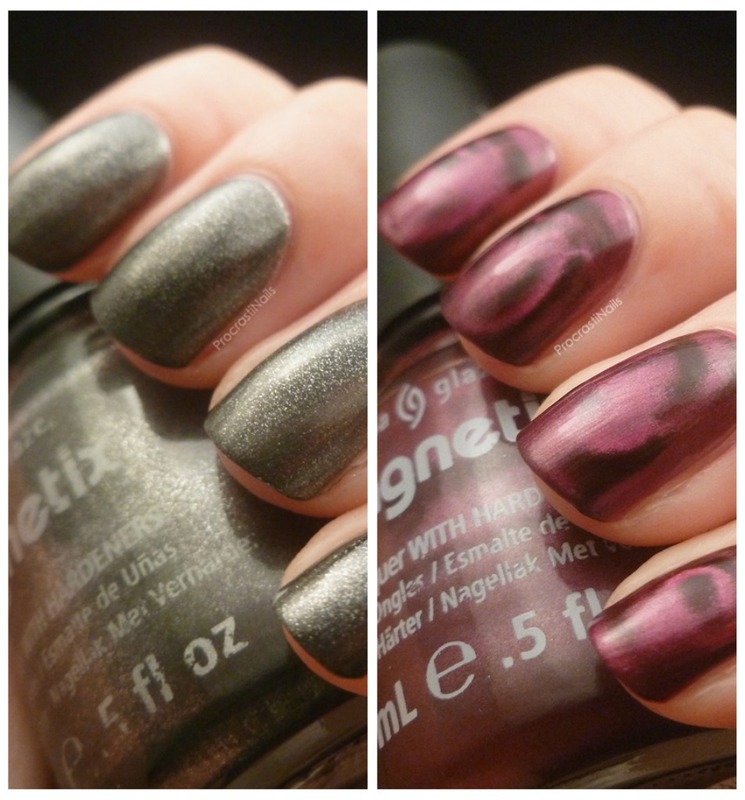 I swatched both of this before and after the use of the magnet, so you can see what they look like as normal polishes, too. Since I really hate doing the magnetic effect my usual way of wearing these polishes is just to use them as a normal metallic shade. On their own they're pretty nice, and they're nicely opaque/pigmented so you can get really good coverage with one or two coats. They're also good for use in nail art, and I imagine they would be good for stamping (though I haven't tried that yet). In these pictures I didn't use any top coat but I would suggest adding it if you were wearing them as a base because the polish is slightly matte. 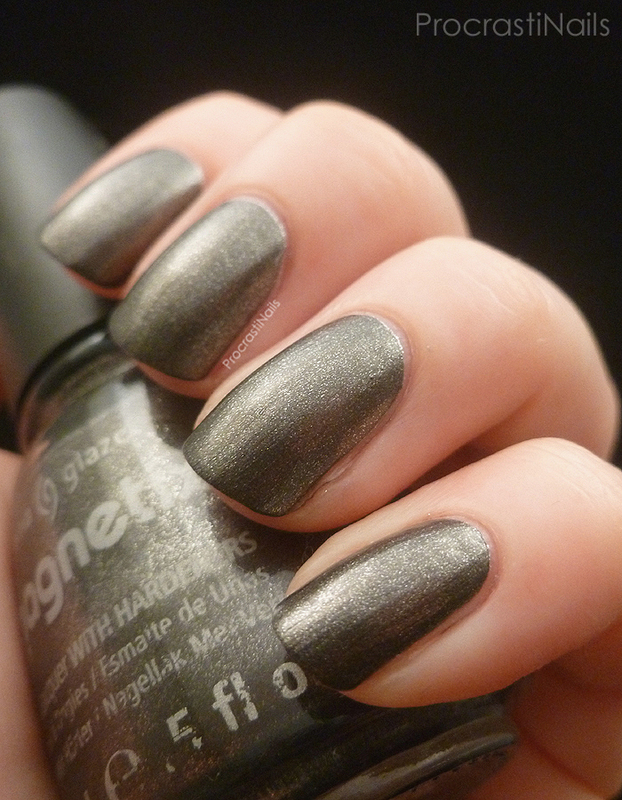 Attraction on its own is a lovely, warm metallic coal grey. You can see the flecks in it make it look very sparkly and shimmery! And believe it or not, this is a shot of it using a magnet. I used one with vertical straight lines going down, so part of the issue here is that the natural shadows in the picture line up with where the darker magnetic bits decided to pop up. You can see a bit of it on my ring finger - the magnet makes both darker and lighter bits come through. Positively in Love is a lovely plum shade. It applied really well, again with just one or two coats. And again I would suggest adding a top coat if you were going to wear it on its own since it dries to a satin finish. The magnet I used this time worked out MUCH better, as you can see. Though my circles aren't consistent or particularly attractive you can at least make them out. I know that certain designs (for whatever reason) have stronger pulls with the polish, so if you were to try these yourself I think it would just be some trial and error to see which worked best on your nail shape. Nice swatches of them. 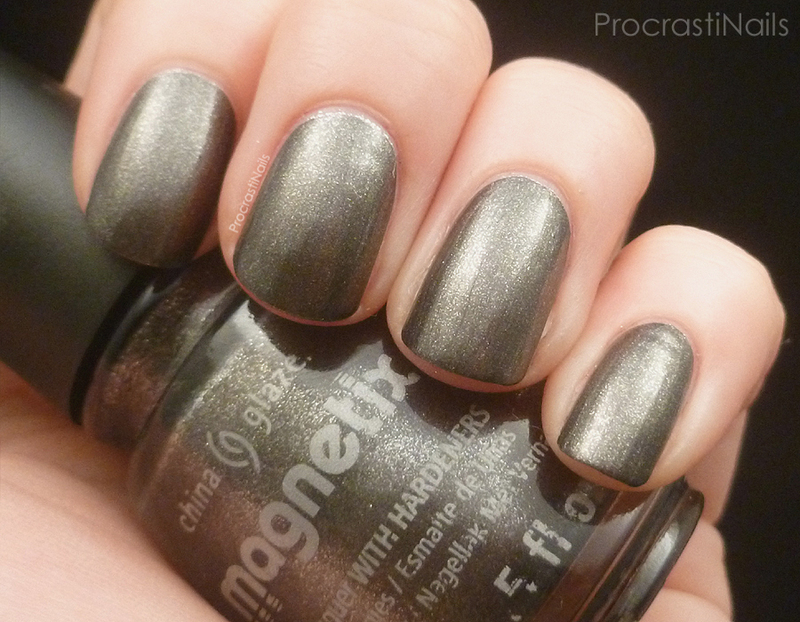 I only own one magnetic polish and its okay.